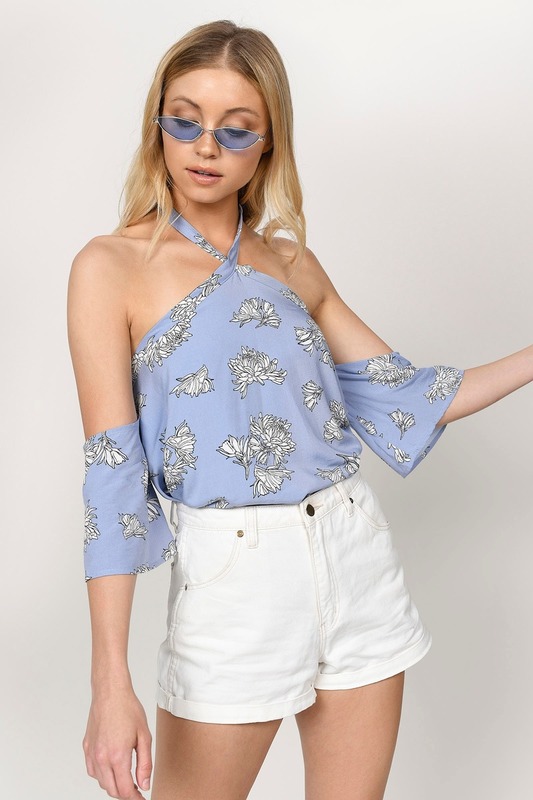 Check out Tobi's Rachelle Blue Print Cold Shoulder Blouse We're simply obsessed with the Rachelle Blue Multi Printed Blouse! Featuring a cute floral print on a rayon weave with a halter neckline, cold shoulder sleeves, open back, and fully lined interior! Pair with the Naomi Floral High Waisted Shorts to complete the look! We're simply obsessed with the Rachelle Blue Multi Printed Blouse! Featuring a cute floral print on a rayon weave with a halter neckline, cold shoulder sleeves, open back, and fully lined interior! Pair with the Naomi Floral High Waisted Shorts to complete the look!